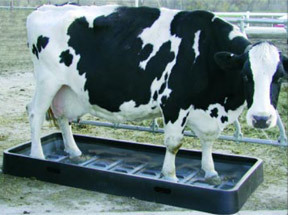 Polydome Foot Baths Helps Prevent Hoof-Rot and Heel Erosion-Reduces Lameness. 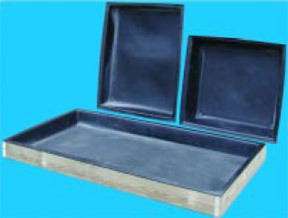 A disinfectant solution (copper sulfate mixed with water) used in the footbath will kill or inhibit bacterial infections such as foot-rot and heel erosion. It penetrates up between toes and cracks, where bacteria inflames the soft skin, and then under the horn lining and inner surfaces of each cleat. By locating the PolyDome Footbath at the exit door of your stall barn, or in the exit lane of the milking parlor, cows walk through it twice a day. The disinfectant solution hardens the horn and toughens the skin in vital areas between cleats of the hoof. This drying effect on hoof and skin makes cattle’s feet more resistant to bacterial infection. 54" x 84" x 6" Deep Self-supporting and contoured interior. 36" x 36" x 7-1/2" Deep Must be supported by 2" x 8" wood frame. 36" x 72" x 3-1/2" Deep Must be supported by 2" x 4" wood frame. 36" x 72" x 5-1/2" Deep Must be supported by 2" x 6" wood frame.